The 2018 GWS GIANTS AFL Women’s squad will be rich with AFL Sydney players once more, with a total of 13 players from the local competition set to don the orange and charcoal next year. 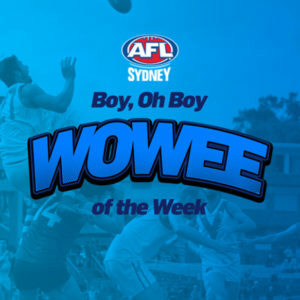 Following last week’s AFL Women’s Draft and Rookie Draft, four new AFL Sydney players joined the GIANTS list for the second season of AFLW. 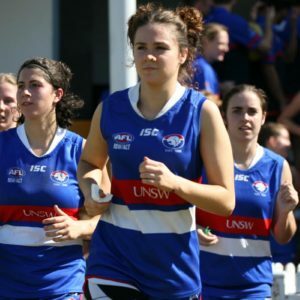 Former UNSW Eastern Suburbs Stingray and AFL NSW/ACT state player, Courtney Gum was the first to be drafted from the local competition, selected at pick 25. Currently playing for Glenelg in the the South Australian National Football League (SANFL), Gum has a long history in the AFL Sydney competition as the inaugural winner of the then unnamed, Mostyn Medal in 2012 for the Best and Fairest in the Women’s competition. Gum was also the first ever woman to take home the prestigious Howarth Trophy in 2013 for the competition’s best Representative player. Coming off a stellar season with Glenelg, where she claimed the SANFL Women’s Best and Fairest title, Gum was also one of the inaugural Melbourne Demons to play in the historic 2013 Women’s Exhibition match against the Western Bulldogs – before AFLW was implemented. 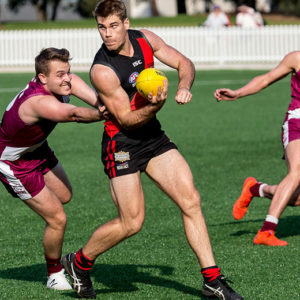 Soon after Gum’s selection at pick 25, UNSW Eastern Suburbs had another of their players heading to Tom Wills Oval with AFL Sydney representative player, Phoebe Monahan chosen at pick 38. Poling just five votes behind her new GIANTS teammate, Amanda Farrugia and two votes behind GIANT Nicola Barr in the 2017 Mostyn Medal, it is no surprise that the Premiership winning midfielder has made her way onto an AFLW list. Selected as a free agent following the AFLW Draft, the Western Wolves’ Melissa Freckleton is now also a GIANT. As one of the big names in the AFL Sydney competition – having played in the AFL Sydney representative team – Freckleton looks set to play forward for Greater Western Sydney in 2018. The Auburn Penrith GIANTS now have two AFL Women’s stars in their senior team, with Haneen Zreika joining Renee Tomkins at the GIANTS following the AFLW Rookie Draft. 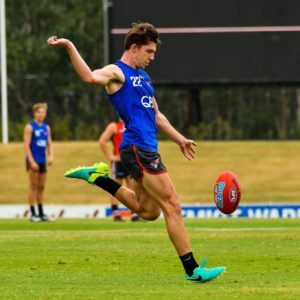 Touted as one of the most exciting prospects to come out of this year’s crop of talent by the Melbourne media, Zreika’s tenacity in the contest has seen her selected by the GIANTS. After being scouted by AFL staff at a school program, Zreika’s rugby league background also means her ‘step’ will be one for her opponents to get around next year. Gum, Monahan, Freckleton and Zreika will join fellow AFL Sydney players, Jacinda Barclay (UNSW/ES), Nicola Barr (Sydney University), Ellie Brush (Sydney University), Rebecca Beeson (UNSW/ES), Maddy Collier (UNSW/ES), Amanada Farrugia (Macquarie University), Erin McKinnon (Sydney University), Emma Swanson (Macquarie University) and Renee Tomkins (Auburn Penrith), in the GWS GIANTS side for 2018. The GWS GIANTS pre-season begins on 20 November 2017.